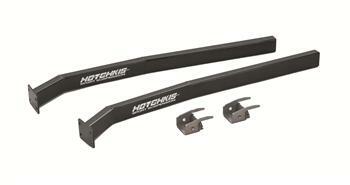 Hotchkis Sub-Frame Connector - Dezod Motorsports Inc - Home of the automotive performance enthusiast since 2002. Hotchkis Sub-Frame Connector are designed to add rigidity to the chassis to improve vehicle performance by reducing chassis flex. Fabricated from 1.5” x 2.5” .120 wall rectangular steel, these MIG welded connectors come powder coated gloss black and include urethane front body mounts. Installation of these connectors does not require modifications or cutting of the floor boards. The rear mount is a weld in, while the front mount is a bolt in with the option to weld. This is a must have finishing touch for any restoration.